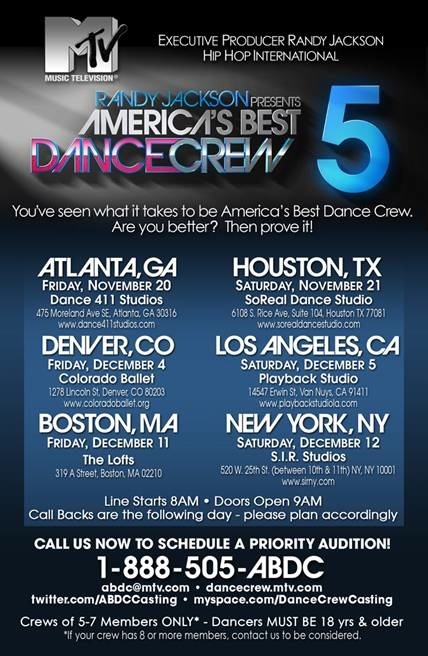 MTV’s America’s Best Dance Crew (ABDC) is once again putting out the call for fierce, fabulous, hard-hitting dance crews with 5 – 7 members (ages 18 and older) for season 5 of the highly popular dance show. Season 5 of ABDC begins on Thursday, January 28. Crews interested in possibly joining the ranks of past winners JabbaWockeez, We Are Heroes, Super Cr3w and Quest Crew can attend auditions held in the following remaining cities: Denver, CO (December 4), Los Angeles, CA (December 5), Boston, MA (December 11) and New York City (December 12). For more information, check out ABDC on MySpace. Or follow them on Twitter at @ABDCCasting.